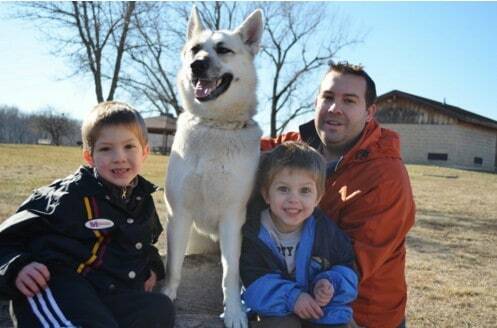 A few years ago we adopted a German Shepherd dog from our local animal shelter. This is our Jenny. 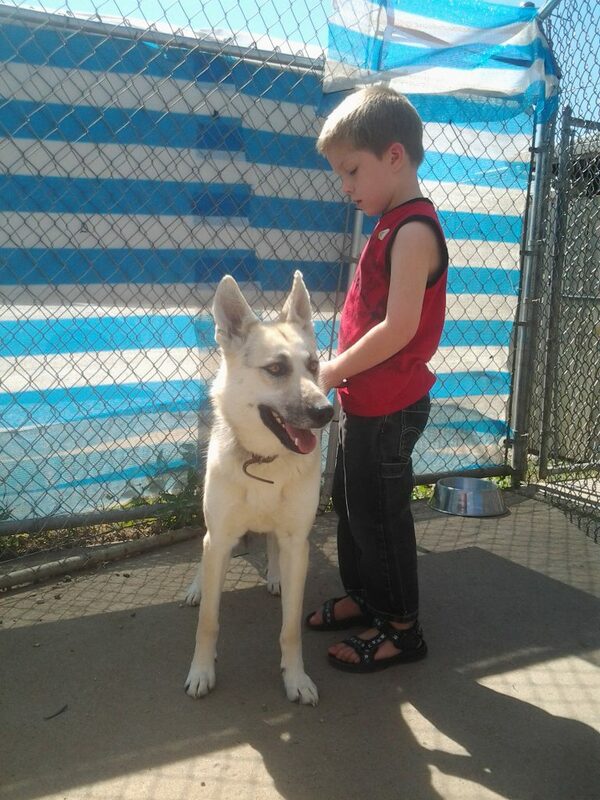 The photo above is the day we all met her at the animal shelter we fell in love….and after we took her home we quickly learned that she was terrified of her enclosed doghouse that we had put outside for her. We tried putting her inside the doghouse and she just shook in terror. We left it there for a few months hoping she would eventually go in but the doghouse has since been donated to our pig! Although Jenny has a VERY thick coat of fur there have been times when we were gone for the day and put Jenny outside on the cable run we installed for her, and she has inevitably been stuck outside during rain or snow. I know she has a thick coat but I love her and feel sorry that she is stuck outside and scared to find shelter in small spaces. I’m not sure of her background since she came from the shelter but unfortunately she does not like being indoors for lengthy periods of time either! So when it started warming up in the spring I was determined to find a better cost effective solution for her in case she happened to be outside during a storm. 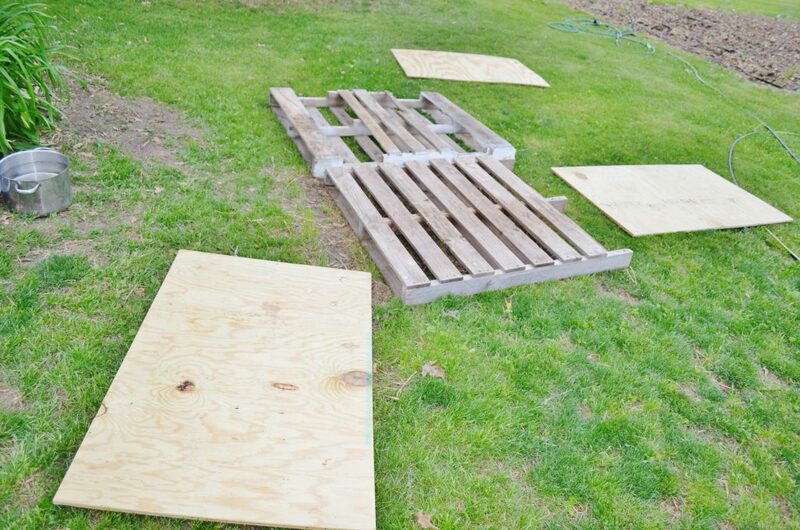 We decided to put one pallet on the floor to keep Jenny off of the ground during the rain and cold weather. The other pallet, since we only had 2, was used for the back wall. During the summer we will leave it open for breeze and so that maybe she won’t feel so enclosed. We added plywood to either side as well as onto the roof to create the other walls. In the winter we will stuff the back pallet wall with straw (not hay as it could mold) and tarp it up to make it water proof. 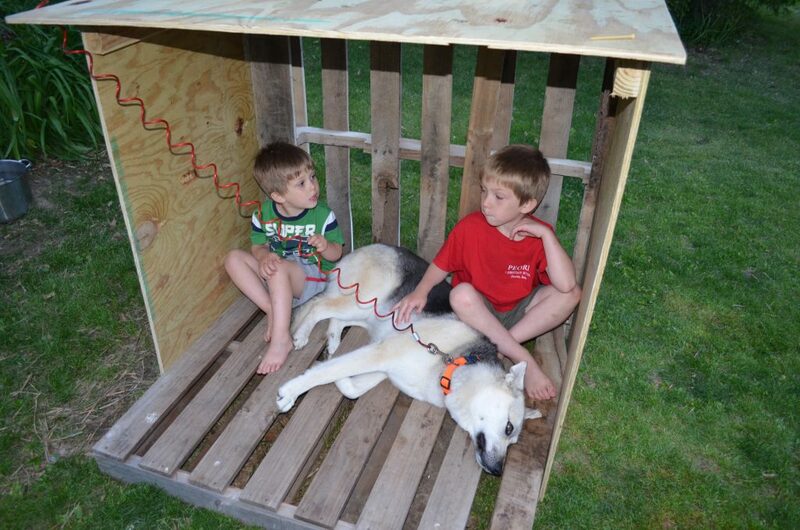 We’ve since added some leftover shingles onto the roof and sides of the dog house to help with the weather and heat. After working with her to use her home for a year we added a large piece of wood plywood propped up in front of this to keep the elements out of her home which has been fantastic. She can walk into her dog hut on either side where there is an opening. We’ve also added a large plastic “bed” we picked up at the farm store that we fill with straw in the winter months. Success! With a little coaxing from the kids she climbed right inside the lean-to with the boys. 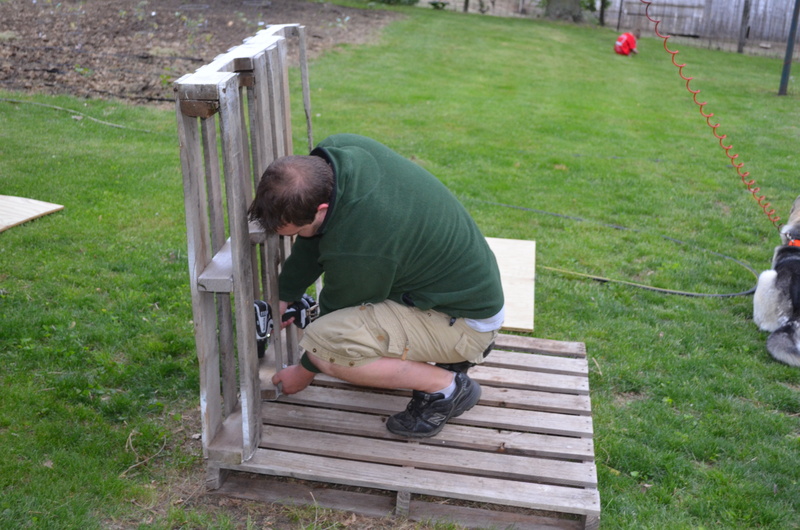 This project can range from free if you have scrap wood or free wooden pallets to whatever the cost of wood and screws may be. It’s definitely cheaper than a traditional dog house if you have a pet who is frightened of small spaces. We have since added shingles all the way around and stuffed the back pallet with a square bale of hay for a little extra warmth! You really can’t add too much protection so just add extra coverings as you have it available! You can also just staple on a tarp if you don’t have extra shingles to help keep the shelter dry. In the winter we also have a large piece of plywood that we prop up in the front which blocks most of the elements for her. To find a local animal shelter near you check out aspca.org. If you are not able to rescue an animal consider donating a bag of food or box of litter to help! This is a terrific, caring and thoughtful solution. She is obviously a well loved dog! And an important part of your family! Many are left on their own outside their entire lives. (Our dog trainers have always told us though, that a dog should never be left on a cabled run, or tethered when no one is there. 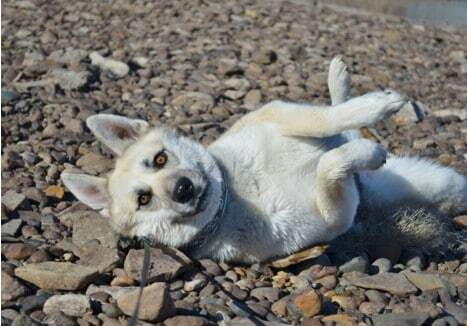 Anyway, she is a lucky pup to be loved and cherished. This little dog house is absolutely adorable with the pallet wood! My brother works in a warehouse and has a lot of spare wooden pallets that he does not know what to use for. 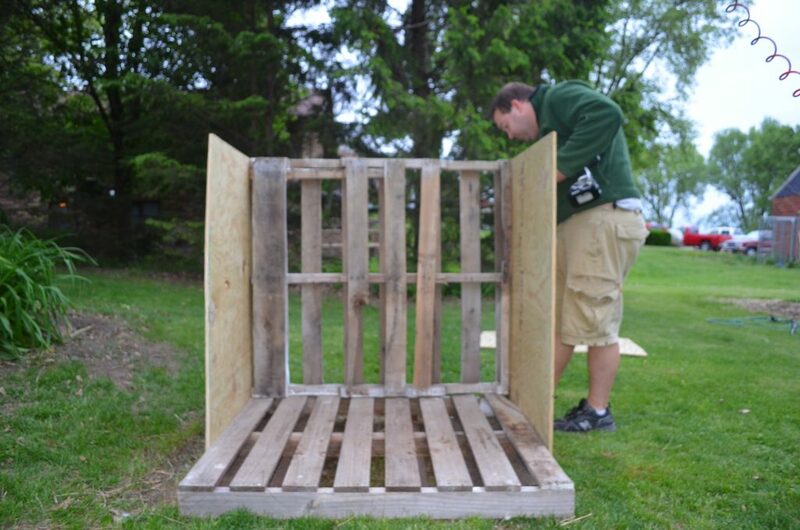 Just like you mentioned, sometimes we have to leave for the day and our dog has to struggle outside in the snow or the rain; however, with all of the pallet wood from my brother, we could build something like this that can keep him protected. Thanks again!